As you all know, I am a big Do-It-Yourselfer. However, there is only so much time one has in any given year to do things yourself, or learn how to do things yourself. This year is the year of gardening. And woodworking. Okay, I haven't exactly taken a class. And it's not exactly something from a fine furniture store. (More like IKEA, as Jason told his mother.) 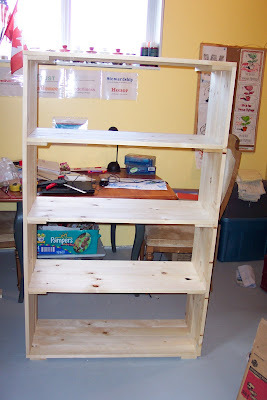 But I designed and created this very functional, very sturdy bookshelf, inspired by the need to find something big enough and strong enough to hold my scrapbooks and scrapbooking supplies. 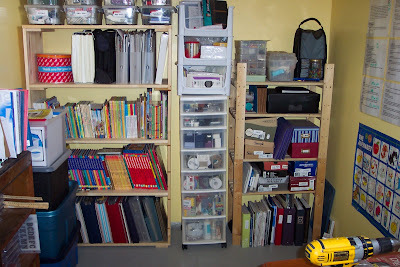 (Most bookshelves do not have enough space between shelves for a scrapbook to stand vertically.) Jason cut most of the wood for me. Although I have been getting over my fear of saws (something about a vivid memory of the tip of my uncle's finger being cut off while using a table saw while I was only 8 or 9) and would have done it myself if I had to, it was kind of cool to be able to work together on a project for once. You know. 'Cause I have hardly anything else to do with my time. WooHoo for you! I'd buy one of those, do you deliver in Sask.? Hi, Dawn! Hmmm... I'll let you know if the opportunity arises. Or! I could just tell you how to do it! It was pretty easy. Thanks for dropping by!